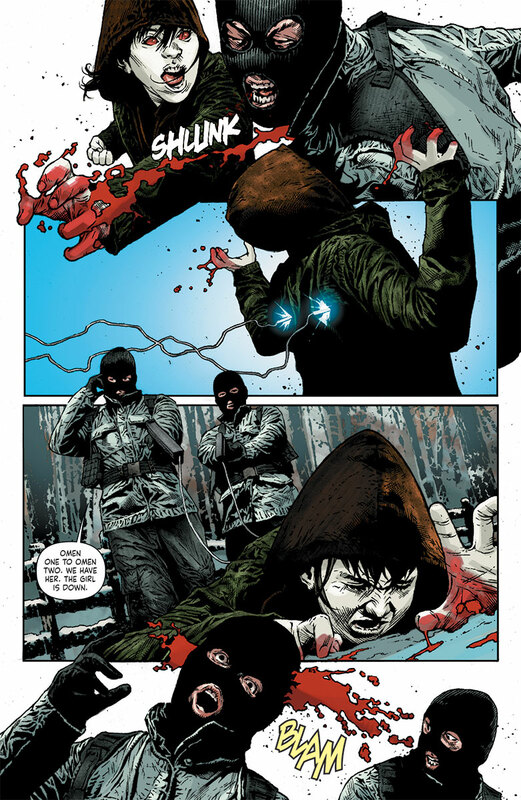 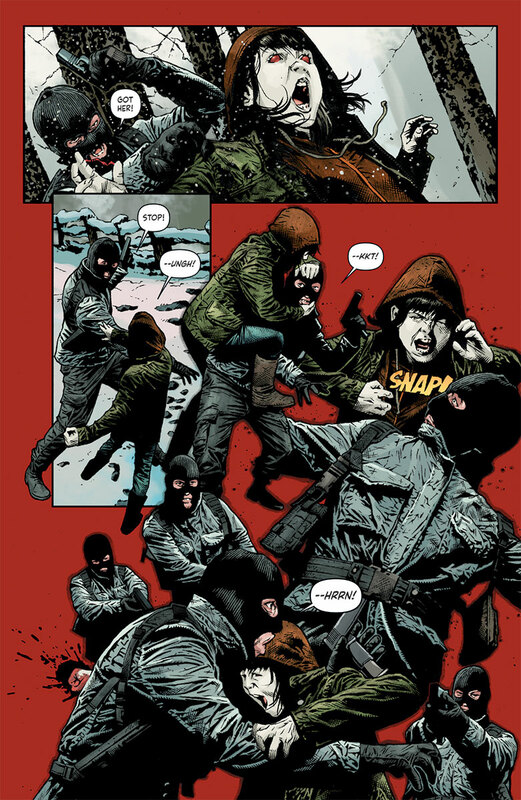 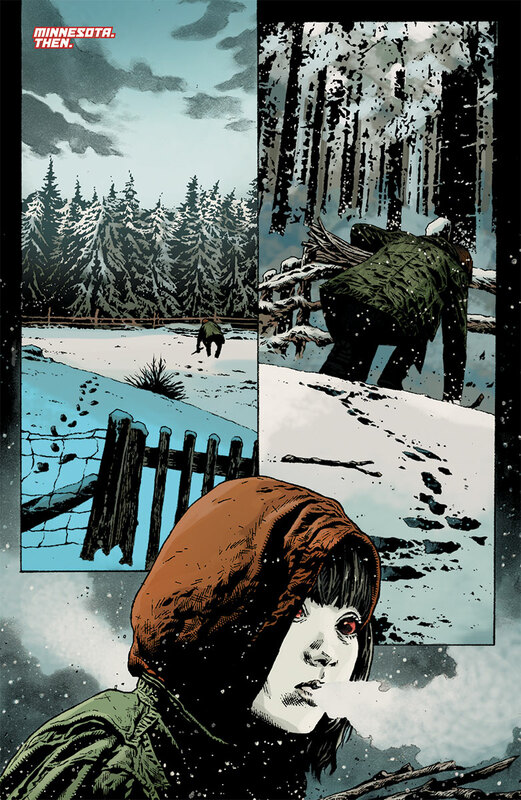 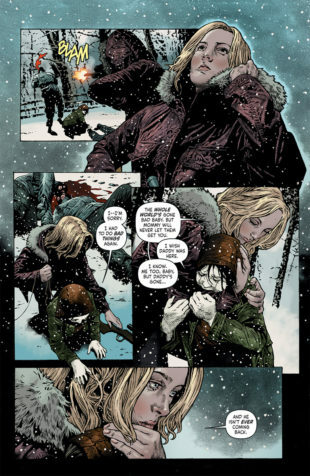 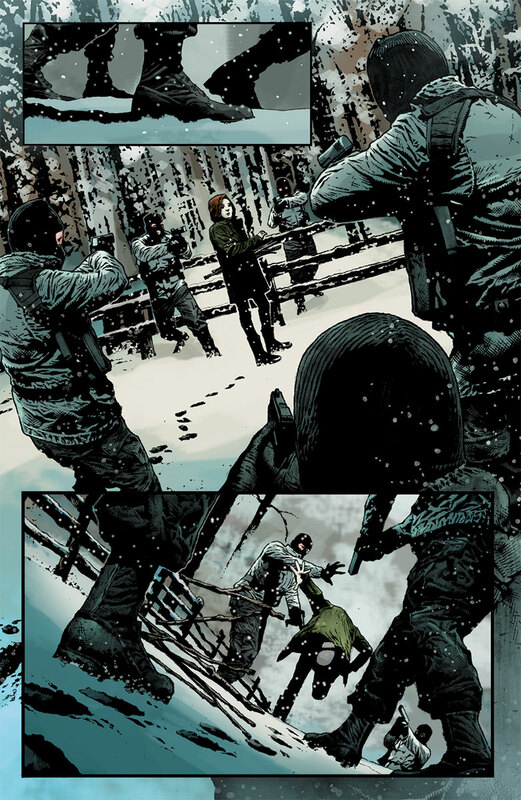 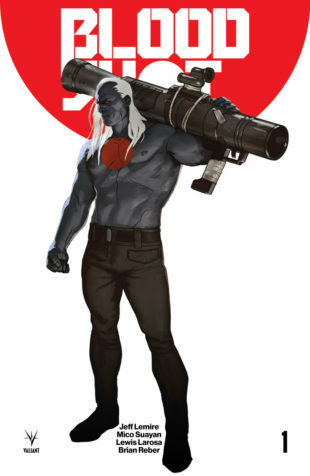 As revealed at Entertainment Weekly, Valiant is proud to present the first lettered look inside BLOODSHOT SALVATION #1 –the FIRST ISSUE of the BLOCKBUSTER NEW ONGOING SERIES from New York Times best-selling writer Jeff Lemire (BLOODSHOT REBORN, Black Hammer) and extraordinary artists Lewis LaRosa (BLOODSHOT REBORN, SAVAGE) & Mico Suayan (BLOODSHOT REBORN)! 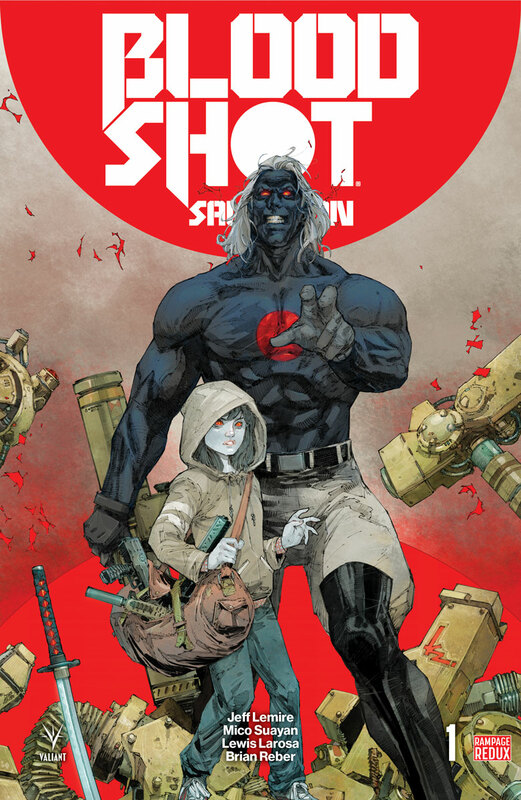 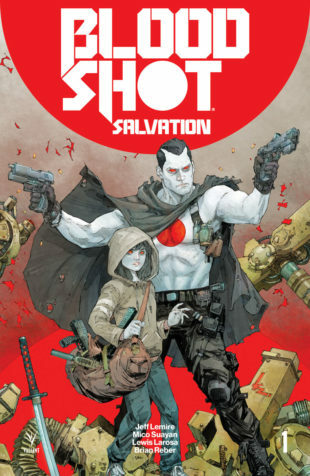 On September 20th, violence, vengeance, and villains await Valiant’s machine-made soldier as Ray Garrison and his newborn daughter, Jessie, enter an unforgiving gauntlet of punishment that will bleed into the dark future that awaits them both…and will forever redefine the tragic and brutal legacy of Bloodshot for years to come! On September 20th, Bloodshot’s most devastating mission yet begins with a tooth-and-nail fight to protect the family he’d give anything for… Witness the carnage to come as Jeff Lemire, Mico Suayan, and Lewis LaRosa unleash Valiant’s must-read series of the season in BLOODSHOT SALVATION #1 – featuring covers by Kenneth Rocafort (The Ultimates), Monika Palosz (DIVINITY III: STALINVERSE), Tomas Giorello (X-O MANOWAR), Ryan Bodenheim (The Dying & The Dead), Greg Smallwood (Moon Knight), and Dave Johnson (100 Bullets)! 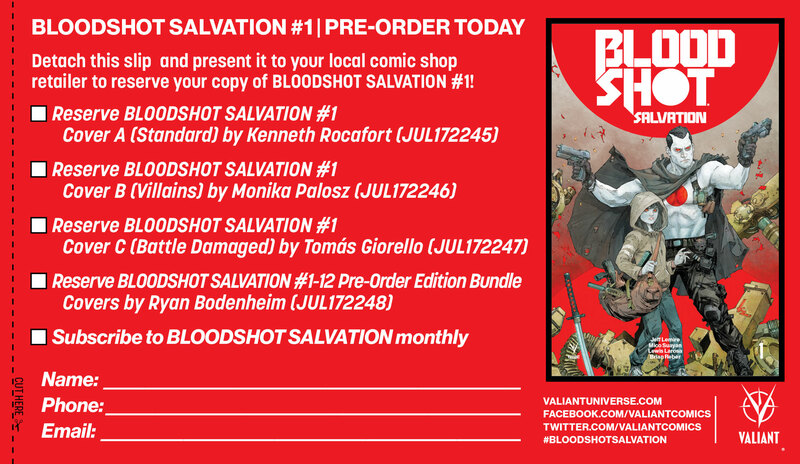 PLUS: Fans that order this one-time bundle by July 27th, 2017 will also receive the BLOODSHOT SALVATION #1 RAMPAGE REDUX – a FREE, LIMITED EDITION, and FULL-LENGTH COMIC BOOK – polybagged alongside the series’ first pre-order edition! 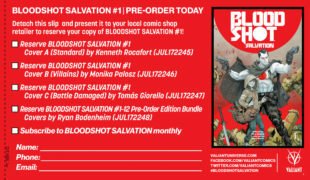 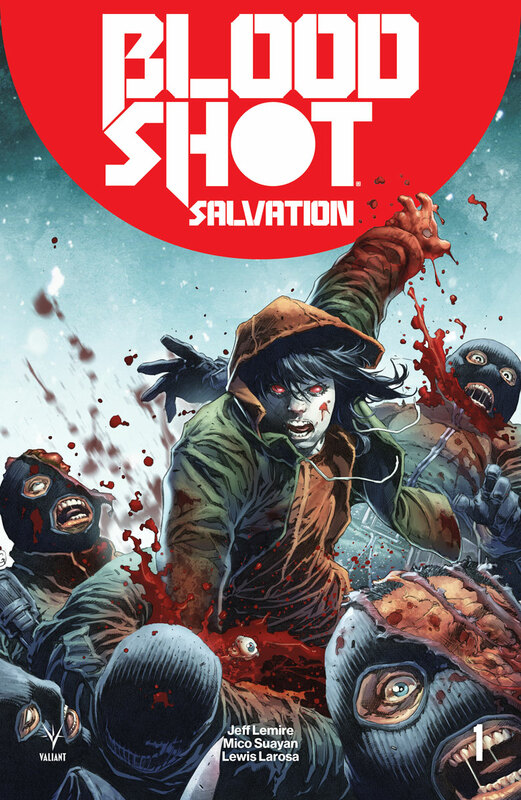 Featuring the raw, black-and-white interior artwork of powerhouse artists Lewis LaRosa and Mico Suayan, plus brand-new bonus features – including “Top-Secret Mission Reports,” “The Biology of Bloodshot,” “Bloodshot’s Body Count,” and “The Complete History of Bloodshot” – this expanded encore presentation of BLOODSHOT SALVATION #1 is available ONLY as a pre-order bonus and will never be offered for individual sale!